Welcome to our indepth review of the Honda eu3000is — A whisper-quiet inverter generator that can get your through a power outage, power your food truck or power your tools at work. We give you a detailed look at the eu3000is and compare it to the eu3000i Handi model as well as review several other comparable 3000W portable generators. This review is going to focus primarily on the Honda eu3000is which is, in my opinion, one of the most practical portable generators for an RV and for basic home backup power. It is also useful for less demanding jobsite power needs. Though I feel this generator is most valuable for RV owners. After reviewing the selected generators, I’ll discuss this in more detail. Even though the Honda eu3000is is the star of this review, I’ll also be reviewing a number of comparable 3000W – 3500W generators, the Honda eu3000i Handi Generator, Yamaha 3000iS / Yamaha EF3000iSEB, and the Generac iQ3500. The Generac being an excellent option for a more affordable inverter generator and it provides you with more watts, so you run more equipment. Before reviewing these inverter generators, I feel obliged to answer a frequently answered question: what is the difference between the Honda eu3000is and the Honda eu3000i? I’ll be reviewing each model separately. But I’ll start by pointing out their differences for those who would prefer a quick overview of these two generators. Honda EU3000i Handi vs Honda EU3000is. Similar but different. Because both these Honda generators have very similar model numbers, most people seem to think that they are basically the same generator. Although some of the differences may not be all that apparent, they are actually not the same at all. The Honda eu3000is is, most definitely, the more capable of the two and outshines the more basic eu3000i on almost every level. The Honda eu3000is has a larger engine with a higher running load capacity, yet it’s quieter. That, in itself, is quite remarkable. Though, because of the larger engine, steel housing, and an onboard 12V battery, the eu3000is is the heavier of the two. It’s also a little larger, but the difference in dimensions isn’t that great. The Honda EU3000is has a much larger gas tank and this provides better runtimes on a tank of fuel. The Honda eu3000i comes standard with a built-in wheel kit – it forms part of the generator frame. Whereas the eu3000is only has a wheel kit as an optional extra. Though the additional (4-wheel or 2-wheel) kit for the eu3000is is a much better design. It is both more durable and makes the generator easier to move, especially on rough terrain. I suppose this is more important when you consider that this is a heavier generator. The Honda eu3000is is easier to start. It has both an electric starter and a recoil starter as an emergency backup when the battery fails. The Honda eu3000i only has a recoil starter. Ironically, there isn’t much of a price difference between the two Honda models. Though this may vary, depending on the retailer. Of course, when you include the additional wheel kit for the Honda eu3000is, it does become more expensive. Essentially, the Honda eu3000i is a lighter, more portable generator but is slightly lacking when it comes to power output and runtime. The Honda eu3000is is more user friendly, but this comes with a very noticeable weight disadvantage. For a more detailed comparison of these two generators, you can get the full specifications in the review. Exceptional quiet Honda 3000 watt inverter generator. It won’t let you down. The perfect compact inverter generator. Like all Honda generators, the eu3000is is an incredibly durable and well-made machine. It is powered by one of the best small gas engines ever built, the GX200. This is a 200cc, OHV engine that has proven to be an almost indestructible power plant, even when pushed to its limits on a daily basis. The GX engine (in all its variants) is one of reasons why Honda power equipment is the number choice for many construction contractors and farmers, who need a robust machine for continuous heavy-duty applications. Along with a tried and tested engine, Honda have incorporated inverter technology into the eu3000is. This too is of the highest standard, providing a clean, pure sine wave current that can safely power electronic devices under any load. It has a peak power output of 3000W. This is the starting power that the generator delivers for a short period to allow for high startup electric equipment, like refrigerators and air conditioners. The continuous, running wattage is rated at 2800W. This is sufficient to run a fairly large AC, around 13,500 BTU. Though when running this type of load, you won’t have much power to spare for other appliances. Because of the inverter technology, you’re able to sync up two Honda generators in parallel mode and this will double your power output. Another common, and quite useful inverter feature is the economy throttle. When engaged, this mode allows the generator to run at a lower RPM when the load demand is not too high. Running at lower RPM burns less fuel and makes the generator quieter. This also reduces wear on the engine. The acoustic sound insulation used for the Honda eu3000is is better than I’ve seen on any inverter generator. This gives it an almost unbelievable noise level of between 50dBA (at 25% load) and 57dBA (at 100% rated load). This one of many reasons why the Honda eu3000is can be seen as the best generators for campsites and residential areas, where noise can be a serious issue. Even at full load, this generator is quieter than a normal speaking voice. No matter where you use the Honda, there won’t be any complaints from your neighbors about noise. I really like that the sound insulation panels are metal, not plastic like all the others. This is another sign of the Honda philosophy of building equipment that can be knocked about without taking any damage. Safety is tops, the Honda GX200 engine is fitted with a low oil warning light and will shut down before it sustains any damage. The muffler has a USDA approved spark arrestor and the circuits are protected by overload circuit breakers. The user interface is recessed into a shockproof, durable plastic surround. This is safer and more durable than a conventional setup. Large metal handles on either side make it quite easy to carry the 131-pound machine and these handles serve as additional protection from impact. This is quite a hefty weight for a generator of this size. But it is a testament to the ultra-durable design, there’s very little plastic and plenty of tough metal. An optional wheel kit is available which is as tough and functional as the rest of the generator. Two options exist, a two-wheel or four-wheel kit with a very easy to manage handle. There is a duplex 125A, 20A outlet, providing two standard household receptacles, and a 30A, 125V twist lock outlet. There’s an electric starter and the choke is conveniently placed on the user panel. A recoils starter is also fitted as backup. The interface also has a digital display for running hours. There’s a 12V outlet for battery charging and an alligator clamp battery connector kit is supplied with the generator. The gas tank is double protected inside the metal enclosure and is huge for this size generator – 3.4 gallons. This, along with the super-efficient GX engine, provides some of the best runtimes in its class. At 100% of its rated constant load, the Honda eu3000is will run for 7.1 hours. At 25% load, it will keep going for an impressive 20 hours. This gives it a fuel consumption of 5.85 kilowatt-hours per gallon. Few generators can boast this kind of fuel economy. If you take your fuel savings into account, along with the long life expectancy for this generator, it puts the higher than average price tag into context. You won’t be replacing this generator any time too soon and will be saving on gas bills all the while. I’ll always be the first to rave about Honda generators. I genuinely feel that they are just about the best in their robust design and the superb GX engine has won my admiration. Even in the context of fine Honda engineering, the eu3000is stands out as one of the very best. It’s about as quiet as it gets when compared to any 3000W generator and can run for a very long time on a tank of gas. Honda’s legendary reliability is backed by an excellent 3-year warranty for both commercial and residential use. Lightweight 3000 watt portable generator. Enough power to start up an RV A/C units up to 13500 BTUs. ✓ View or download the MANUAL for the honda EU3000i Handi. Even though the Honda eu3000i doesn’t meet the same specifications as the eu3000is, it has the advantage of being lighter and, therefore, more portable. The reduced weight is as a result of a plastic enclosure instead of the steel used for the eu3000is. Additional weight savings are achieved by eliminating an electric starter and battery, as well as using a slightly smaller engine. The Honda eu3000i is equipped with the GX160 (160cc) engine. It is as reliable and durable as any of the marvelous GX engines for which Honda is famous. Despite the smaller engine, the Honda eu3000i has the same 3000 watt peak load capacity as the eu3000is. The running wattage comes in a little lower at 2600W (200W less than the eu3000is). The weight of only 78 LBS and built-in wheels make this a much more portable generator. I’m not a big fan of the small plastic wheels, however. Even though this is normal for small, lightweight generators, they are not designed for gravel or any type of uneven terrain. Noise levels are slightly higher, but still very good. I doubt whether people will actually notice that this model is louder than the eu3000is. At 58dBA (full rated load) and 52dBA when running at 25% load, the Honda eu3000i will never exceed the sound level of a conversational speaking voice. It won’t create a disturbance in a campsite or residential neighborhood. This generator has all the advantages of inverter technology. Which means clean power for electronic equipment, an eco-throttle for lower fuel consumption and noise levels, as well as the benefit of parallel connectivity. The gas tank isn’t all that big and is more in line with other generators with a similar capacity. The 1.6 gallon fuel tank can run a 25% load for 7.7 hours. At the full rated load of 2600W, the generator will run for 3.5 hours on a tank of gas. This works out to 5.7 kilowatt-hours per gallon. Ironically, this fuel consumption isn’t quite as impressive as the Honda eu3000is which has a larger 200cc engine. Though this minor difference won’t affect your pocket in any noticeable way. The control panel is identical to that of the eu3000is with a duplex, 20A 125V outlet, 30A 125V twist lock outlet, and a 12V DC battery charging outlet. These circuits are protected by overload breakers and the engine has a low oil shutoff and warning light. The choke is mounted to the user interface, but you don’t have the benefit of an electric starter. Though the recoil starter works well and the Honda GX engine is renowned for easy starting, even in cold weather. It also has the safety benefit of a USDA certified spark arrestor. For a lightweight, perfectly portable generator, built to Honda’s exacting standards, the eu3000i certainly makes the grade as one of the best 3000W generators on the market. For the slightly lower running watts (when compared to the Honda eu3000is), you gain a lot in portability, thanks to the drastically reduced weight. As we’ve come to expect from Honda, service is of the highest standard and this model is also covered by a 3-year residential and commercial warranty. Advanced features and is extremely quiet (53 dB to 60 dB). Noise Block, acoustically designed sound reduction system ‐ Sound absorbing material, used in key locations, does not resonate sound. Newly designed muffler and molded fan produce unbeatable noise reduction at 53 – 60 dBA. Independent gasoline petcock ‐ Helps reduce carburetor cleaning and repairs by eliminating stale gas in the carburetor. Smart Throttle, load sensing rpm control ‐ Greater fuel efficiency and noise reduction by automatically adjusting engine speed to match the load. Long run time ‐ Continuous operation for up to 18.6 hours without refueling (at 1/4 rated load with “Smart Throttle” function on). 12 Volt DC output, battery charging cables included ‐ Recharge 12-volt batteries for RV, auto, marine, etc. Inverter system with Pulse Width Modulation (PWM) control ‐ Can run products with built-in microcomputers, or microcomputer-controlled electric tools. Centralized control panel ‐ Easy access to controls. 171cc Overhead Valve (OHV) engine ‐ Noise-reducing operation with improved efficiency, increased reliability, and low oil consumption. Oil Watch Warning system ‐ Prevents engine damage to avoid costly repairs and minimize down time adds customer confidence and peace of mind. Four wheels with parking brake ‐ Easy transport and mobility. EPA & CARB Emission Engine Life Rating ‐ Yamaha generators have the longest emission engine life ratings issued by the environmental. Automatic decompression ‐ Greatly reduces starting effort. Environmental Protection Agency and the California Air Resources Board. The EF3000iS features built-in wheels, so its remarkably portable – providing convenient power to the locations you need it most. + Electric w/ recoil & auto decompressor. While my personal preference will generally be for a Honda generator, I cannot deny that Yamaha is a brand that can compete with Honda in all respects. Both Yamaha and Honda epitomize the Japanese reputation for durable machines with incredible fuel economy. On the whole, Honda generators are built for a more rugged environment and tend to be heavier as a result. When it comes to the best inverter technology, I don’t believe any generator manufacturer can hold a candle to Yamaha. In the world of electronic engineering, Yamaha is king. Like the Honda eu3000is and 3000i, Yamaha also have two very similar 3000W generators. The differences aren’t as vast as the two Honda models, so I’ll be reviewing the Yamaha EF3000iS and EF3000iSEB under the same heading. I’ll start by pointing out their differences. The Yamaha EF3000iSEB is the superior machine and is more expensive. There are two distinct advantages to this generator. For one thing, the Yamaha EF3000iSEB has both an electric and recoil starter, whereas the Yamaha EF3000iS only has a recoil starter. Using a recoil starter with the Yamaha engine isn’t much of an inconvenience and automatic valve compression certainly helps. While both these generators use superb (easily the best) inverter technology, the EF3000iSEB utilizes the inverter to the fullest, better than any other inverter generator that I’ve seen. Both generators have a rated running wattage of 2800W and 3000W peak power. But the EF3000iSEB does what no other generator can, by delivering an additional 500 watts of boost power. This is a very short start up boost which can make the world of difference when using an air conditioner (or similar appliance) in conjunction with your regular electric equipment. 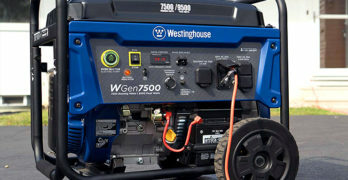 That extra 500W boost means there is a much lower chance of the generator disconnecting the load when experiencing high starting demand. These benefits come at a cost, not just in terms of money, but weight as well. The Yamaha EF3000iSEB weighs 154.3 LBS, the EF3000iS is almost 20-pounds lighter at 136 LBS. Apart from the electric starter, 500W boost power and weight difference, the Yamaha EF3000iSEB and 3000iS generators are identical. The Yamaha EF3000iS / EB generators are powered by a 171cc, 5.5 HP, OHV 4-stroke engine. According to EPA and CARB standards, this engine has the longest emission engine life ratings and this should mean lower maintenance costs as the engine becomes older. Fuel consumption and runtime are acceptable, but certainly not the best. These two generators both have the same size gas tanks, matching that of the Honda eu3000is (3.4 gallons). Yamaha only provides the runtime at 25% load using the eco-throttle, this is 19-hours. By my calculations this works out to be 3.9 kilowatt-hours per gallon, a far cry from the impressive 5.85 KWH/G for the Honda eu3000is. Noise levels are also not quite a match for the Honda. Though 53dBA (25% load) and 60dBA at full rated load is not noisy at all and neither of these generators will cause a disturbance on a quiet evening. The Yamaha EF3000iSEB/3000iS are very modern looking generators enclosed in a sound insulated plastic housing. They have four small wheels with brakes on the front swivel casters. Although small, these wheels look quite tough with steel rims, but I can’t see them doing too well over obstacles. They’re just too small for rough terrain. Two large handles make moving and lifting the generator as easy as it gets. The user panel, positioned at the side of the generator, is easy to use and quite comprehensive. It has 2 X 125V, 20A household outlets and a 30A, twist lock outlet, as well as 12V DC battery charging outlet. The choke is on the panel for easy access and the fuel shutoff valve directly next it. Next to the push to reset circuit breakers are 3 LED indicator lights – one for low oil and a warning indicating overload, with a green light in middle to indicate that the AC load is normal and all is fine. There’s no hour meter, like you find on the Honda 3000W inverter generators. When we compare these two generators to the Honda equivalents, they match up quite well. The Honda eu3000i/s may be more fuel efficient and slightly quieter, but the Yamaha models are not without their merits. One thing that separates the Yamaha EF3000iSEB from the crowd has to be the 500W boost power feature, I really like this. Like Honda, Yamaha is an established and admired brand with a stellar reputation and provide an equally impressive 3-year warranty. Over 5dB quieter than the Honda EU3000is. Ultra Quiet- 40% Quieter than Honda*– advanced inverter technology and enclosure design provide optimal quiet performance. Electric start with PowerDial has three operation settings integrated into one simple-to-use dial. ** 500 more starting watts than eu3000is, based on manufacturer’s specifications. ✓ View or download the BROCHURE and the SPEC SHEET for the Generac iQ3500. A quick price comparison on Amazon between the Generac iQ3500 and the Honda eu3000is, leaves one wondering if the Honda is worth buying. The Generac is a good deal cheaper and it’s more powerful. If money were no object, I’d choose the Honda in a heartbeat. It’s likely to last much longer, especially if you use your generator a lot. Though, in reality, we’re talking about quite a lot of cash here and not everyone wants to spend so much on a generator. As far as budget inverter generators go, the Generac iQ3500 is a fantastic option for recreational use and as an emergency power backup for the occasional power failure. In terms of fuel economy, it’s almost a match for the lean Honda. So, yes this is a good, common sense buy for the less demanding generator user. Like all the generators in this review, the Generac iQ3500 has the advantage of clean inverter power. It also has the option for parallel connection and an economy mode that reduces the engine speed for lower load demand. This generator has the additional advantage of more usable power, 3000W running power and a peak load capacity of 3500W. It also has a very manageable weight of 109.1 LBS, but lacks a wheel kit. It does, however, have quite comfortable carrying handles. Powered by the very capable Generac 212cc, 4-stroke engine with low oil shutdown, this is a very fuel efficient generator. Even though the gas tank isn’t all that big (2.6 gallons), the iQ3500 provides pretty impressive runtimes. At 50% load, it will run for 8.9 hours which amounts to 5.1 kilowatt-hours per gallon. This isn’t far behind the Honda 3000W inverter generators and quite a bit better than the Yamaha models. It has the convenience of a fuel gauge, something the other generators in this review don’t. It also has both an electric and recoil starter. All this is quite remarkable, considering the lower price. No noise levels are provided for the Generac, but it has the same fully enclosed design that one finds on all quiet inerter generators, so I’d expect this to be fairly close to the others. The control panel is great and includes two 120V, 20A household outlets and a 30A twist lock outlet, as well as two USB ports for charging devices, like cell phones. It also has a handy LCD display with very useful information. It will display your watts and hours, as well as the fuel level and your expected remaining runtime. This is a very user friendly generator. All things considered, the Generac iQ3500 is a remarkable inverter generator for its very reasonable price. It’s reassuring to see that, despite being quite a lot cheaper than the other generators reviewed here, this one has the same 3-year warranty. If you’re looking for cheaper alternative to the Honda eu3000is, this would be my first recommendation. To learn more about Generac products, visit their site. Does a 3000W generator supply enough power for an RV? In the introduction, I mentioned that the Honda eu3000is is the most practical generator for an RV. Though the emphasis is on practical and some users may find that a peak load capacity of 3000W doesn’t quite meet their requirements. Practicality comes into the picture when one looks at the size, weight, and fuel consumption that this generator offers. These are important considerations when using your generator to power an RV. Though, in general, a 3000 watt inverter generator from any manufacturer should be quite capable of supplying enough power for most RV owners. This could depend a lot on your air conditioner as this is likely to be the appliance that draws the highest wattage. Looking at the power required for an AC, a generator with a 3000W peak load capacity should start and run a typical 13,500 BTU RV air conditioner. On average these air conditioners need approximately 2800 – 3000 watts to start and draw a continuous (running) current of about 1500 – 2000W. This means that with this size AC, you have basically enough power for your air conditioner, and little else. If you’re using a 10,000 BTU air conditioner for your RV, a 3000W generator could be the perfect size. Though I’d recommend using a 12V DC refrigerator and propane for your cooking. When using a microwave oven, you’d need to switch the AC off to prevent an overload. When looking at the Honda eu3000i/S, these generators have a 12V DC outlet for charging the deep cycle battery for your refrigerator. This circuit hardly affects you’re your running load, so you should be able to run a 12V DC refrigerator continuously and the battery will charge whenever the generator is running. A 10,000 BTU AC will require about 2000 – 2300W to start and then use roughly 700 – 900W continuously. This gives you enough power to run all your essentials with the AC on. Your air conditioner cycles, so you need to always remain within your peak power limit, allowing for the fact that the air conditioner could start at any time. This gives you around 700W – 1000W reserve power for equipment like lights, TV’s, your stereo and a laptop. All these appliances combined could be as low as 400 – 500W. You always have the option of switching the AC off for a short a period if you want to use a toaster oven, hair dryer, microwave, or any other high-current appliance. You’ll soon get used to the power limitations and develop a habit of switching some stuff off when needed. Given the size, weight and economy of a 3000W generator, I feel it’s perfect for any RV that is fitted with an air conditioner no larger than 10,000 BTU. The inconveniences of having a smaller generator will seldom be noticed, if at all. It’s important to note that when using a 3000W generator to power your RV, it’s going to be drawing close to its maximum load capacity most of the time. So an inverter becomes quite critical. A more powerful generator won’t be as greatly affected by load changes and will experience lower levels of harmonic distortion. I’ve written extensively on the topic of inverter generators and, by now, I think most people understand the benefits of inverter power. The most of important of which is the low harmonic distortion, pure sine wave that won’t cause damage to electronic equipment. The fuel saving advantage of the economy mode is another. Most inverter generators have a switch on the control panel that will lower the RPM to save fuel and lower noise levels. This switch can go by many names: eco-throttle, economy, smart throttle, or quiet mode. This can be a handy feature if used correctly. I’ve notice, when reading through customer reviews, that many users are having difficulty understanding when and how to use this function. The pros and cons of inverter generator economy switches has been a hot topic of debate between my colleagues and me in recent times. So I’d like to take a little time explaining how best to make use of this feature on your inverter generator. Before understanding how to make the best use of your economy switch fitted to your inverter generator, it’s important to have a basic understanding of harmonic distortion. The main reason for using an inverter generator is to prevent HD and, if used incorrectly, the eco-throttle could make the situation worse. Harmonic Distortion (HD) is easier for people to understand if we translate this into sound waves. Essentially, sound waves and sine waves work in the same way. Both wave types will distort and we have all noticed this with sound waves. When the amplifier on your stereo is pushed beyond its normal limits, you’ll notice a distorted sound coming from your speakers. Although you can’t see or hear it, the power provided by your generator does exactly the same thing. Once a generator reaches a certain point (usually upwards of 75% load capacity), the sine wave becomes distorted and this is known as Harmonic Distortion (HD). You electric current pulses at 60Hz (60 pulses per second). This is very fast and it’s important that your frequency (hertz) remains stable at all times. This is most important when dealing with electronic circuits which are prevalent in almost every electrical device. Standard generators maintain a constant RPM to keep the frequency at 60Hz. If the engine speeds up or slows down, the frequency changes with it. As the load supplied by generator changes, the engine throttle automatically adjusts. But this cannot happen in the required time (0.1 second), so the frequency will jump around erratically while the engine adjusts to the load. To compensate for this, an inverter is used. Basically, power is stored and released using capacitors, which act like mini-batteries. Transistors are then used to create a perfect sine wave, pulsing at exactly 60Hz with less than 3% deviation (<3% THD). When you switch your generator to economy mode, the RPM is lowered. Ordinarily this would mean that your frequency should be affected. But the inverter uses the capacitors and transistor to adapt to the slower engine speed. But a capacitor can only store small amounts of power and this means that the economy mode can only operate with a low power demand. This is typically 25% of the total running capacity or less. If, for example, you’re using an air conditioner with the economy switch in the on position, things work fine while the AC compressor is not running. When the compressor switches on (which happens automatically), your power demand suddenly surges. The inverter is no longer capable of providing a constant frequency at low RPM. So the engine now has to increase speed. But it can’t do this in 0.1 second, it can take a second or two before the engine RPM matches the frequency needed. During this time your HD goes crazy, jumping from high to low frequency and the inverter cannot keep up. The bottom line is never use your economy switch when there is a high load demand. If you read your instruction manual it will probably tell you to only use economy mode for a load less than 25%. This is important, and I hope I’ve explained this properly. I feel that the economy switch on an inverter generator is only useful when you’re watching TV or listening to music at night with a few lights on and the AC switched off. This is the time when you’ll most appreciate the lower noise and you’ll be saving a bit of gas at the same time. Reducing the RPM doesn’t save all that much on gas. So it’s pointless trying to save gas when you have a fluctuating load that exceeds 25%. In the end, the damage to your electronic equipment does more harm than the small gas savings can justify.